Gordon Salmons personal to you canine training service (established 26 yrs) offers professional tuition for owner and pet. The exercises with yourself and your pet are designed so that the animal does not become confused with the continuity change. Breeds and types vary widely and we are unique in that we cater through knowledge for all canine personalities and traits within this wonderful animal. 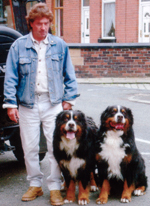 During the very early seventies Gordon was extensively tutored by his employers, Securicor (dog section) at Liverpool, Manchester, Bolton and Bury. His schooling syllabus included basic and advanced obedience training, control, handling, behaviour and management plus welfare of the canine canis before qualifying and becoming a senior officer of the dog section. His knowledge and continuing studies of the canine is recognised by the judiciary where Gordon is employed as an expert in court cases involving the canine. If you are experiencing a legal problem involving your pet or someone else's consult us first for free advice. Our solicitors are always listening. Gordon Salmon has worked with the canine directly in a practical manner for over 52,000 hours, not only here in the UK but also in Europe and the Far East, hence the name of our business! He has featured on television and radio on a number of occasions for his expertise. His client portfolio boasts celebrities. He has also been covered by numerous magazines and newspaper's with regard to his work and natural ability to communicate with the canine canis, "An original dog whisperer" to quote a popular term! He is a member of the institute for animal care education. Holds a distinction in canine behaviour and canine psychology. His own studies of the canine canis is ongoing, you never cease learning! If you have just purchased your first ever puppy or experiencing behavioural problems with your dog or considering obedience lessons for your pet whilst improving your own skills, contact the office number without obligation. Professional advice in regard to the training, socialisation, welfare and management of your pet or a quote for Gordon's personal service is free. You need to talk dogs. Gordon will talk dogs too! Speak to the rest then call the best. Our fees are extremely unbeatable!!! Just compare! !